Looks like that was a pink salmon from the Weir… see confirmation below from my friend Tom Quinn (University of Washington, Seattle). 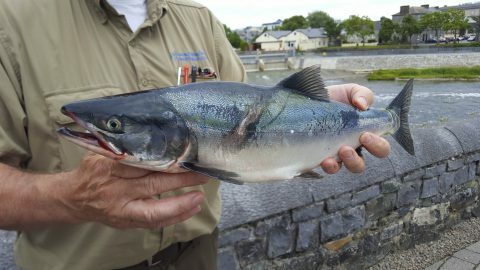 We’ve had several of these over the years from Galway and the Moy. Probably strays from the Kola Peninsula in Russia where they were ranched many years ago (originally from Eastern Russia ). They are now resident in many of the Russian Atlantic salmon rivers close to Norway. Any others I’ve seen or have caught had a much more pronounced hump but were around the size of this fish. Little did I realise what lay ahead of us this past summer! By mid-July more and more records of pink salmon began to appear and by late August some 8 European countries had seen these fish in their rivers and streams. At this stage concern grew and the authorities issued conservation notices, asking anglers to retain any pink salmon caught and to immediately contact IFI with information on its capture. It is now mid-September as I write and it is known that there are hundreds of adult pink salmon in some of the larger rivers, particularly in Norway and Scotland. Fish have by now mated and spawned successfully. Concern is such that there is a whole series of experiments underway to look at the viability of pink eggs in conditions common to Britain and Ireland. But where did the fish come from and what caused such a massive survival of pink salmon over the past two years? The truth is that at present we only have tantalisingly small fragments of information but each week that goes by the picture is becoming clearer and clearer. The first efforts to establish pink salmon in Europe were in the 50’s by the Russian authorities. Pink salmon occur in two forms; one group returns in even years to spawn and one returns in odd years, and generally these two races do not mix. The first stockings were from even-year stocks taken from the southern range of the pink salmon in eastern Russia. After several decades it became clear that these fish were not capable of establishing populations in the colder, Atlantic areas of Russia. In the 1980s, right up to 2001, pink salmon eggs were taken from odd-year stocks (living in the colder areas of the salmon’s natural range in the Pacific) and stocked into rivers in the White Sea area of the Kola Peninsula, and subsequently into rivers in northern Norway. These fish have taken hold and in some years are providing large commercial catches at the mouths of their adopted waters. It is likely that the fish we are witnessing entering Irish rivers are stays from these stocks. The pink salmon are the smallest of the five Pacific salmon species and in European waters they range in size from 1kg to occasionally 2.5kg, but are normally 45cm to 55cm in length. They are small enough to colonise not just the big rivers but also medium sized streams. They’ve defied the experts and showed that, contrary to what was originally thought, they do not need salt water to complete their life cycle. Following their introduction to the great lakes in North America populations have exploded and are now abundant and thriving. They are a popular sport fish in these waters. The life cycle of the pink salmon involves running back to freshwater over the period July to August and spawning during the summer months into early autumn. There are currently lots of unknowns as to what might happen to pink salmon eggs once laid in southern European waters: will they hatch in the early winter and successfully make their way downstream to estuarine waters, or will they die as they struggle to complete the early part of their life cycle? What is known is that across their natural range the colder temperatures of autumn delay hatching and the tiny young, 2cm to 4cm long silvery smolts, run to the estuaries in spring (May). They need shallow, rich estuaries to thrive as they dally here for a month or more before moving out into the ocean proper. They spend two years feeding in the ocean before returning to their native rivers. While feeding at sea, and on their return to the nearshore and the estuaries, pink salmon are considered fine food fish and support major commercial fisheries throughout the Pacific Ocean. It was the extent and value of such commercial fisheries that encouraged the Russians to begin ranching pink salmon in European rivers 60 odd years ago. Unlike our Atlantic salmon, they are poor at homing – or perhaps they excel at colonising new waters? – but even in their native areas they are renowned for turning up in the most unexpected locations. Friends who have fished for returning pink salmon tell me that in the sea, estuary and the lower river pools, fresh, silvery pink salmon are excellent sport fish. They take brightly coloured flies (e.g. pink & white Clouser Minnows, Pink Comet, Pink Beach Comber) and fight hard. The flesh of these fish is excellent. However, on their return to freshwater the pinks quickly change colour. Since they are not feeding, nutrients are quickly diverted away from the muscle of the fish into the maturing eggs and milt. The fish become discoloured and the distinctive hump appears on the back of the returning salmon. Impacts on our native fish? Obviously the greatest concern we all have is the likely impact of pink salmon on our native salmon and trout populations. It is certainly far too early to know what these impacts might be but it is fair to speculate that these might include both positive and negative effects. Experience from both Russia and, more recently, Norway and Finland, indicate that the eggs and fry of pink salmon provide an excellent food source for the resident fish. It is suggested that one of the main reasons for brown trout leaving the freshwater environment to migrate to sea (and therefore become sea trout) is the lack of opportunity for the females to feed and grow large. Perhaps this transfer of additional marine nutrients from the oceans into the rivers, through the contributions made by both the pink salmon eggs and by the decomposition of the dead adults, might enrich the waters and lead to a greater proportion of the trout stock staying put as resident fish. For the past number of years I’ve done some work in Chile on a similar invasion which is taking place in that country by Chinook or King salmon (Oncorhynchus tshawytscha). As with pinks, all of the adults die after spawning and certainly in Chile there is very grave concern in relation to the massive deposition of marine nutrients via the decomposing bodies of the giant Chinook. The main problem seems to be that there are no natural cycles within the rivers to cater for such a sudden injection of additional nutrients. In addition there are no bears and the only top carnivore which is inclined to feed on the decomposing carcasses are the cougars or mountain lion, which , it seems, are developing quite a taste for these wonderfully nutritious fish. Impacts on our rod fisheries? A few years ago, while working on the so called Northern Rivers in Russia (Kharlovka, Eastern Litza etc – see here  ) my visit coincided with a large influx of spawning pink salmon. In the evenings fish after fish readily grabbed my salmon fly, even after they had spawned. Many were covered in a thick layer of naturally occurring fungus and it was far from a pleasant task unhooking these poor creatures. There were so many dead or dying fish that the smell of rotting carcasses was very off-putting and drove me from fishing some of the better Atlantic salmon pools. In my view, one of the major concerns I would have in relation to a pink salmon invasion into Atlantic salmon or sea trout rivers is that, while the influx of these fish might well provide some angling at the river mouths and lower pools, once the fish have entered the main channels and have quickly changed colour, they will take from the pleasure of fishing these waters. Spawning as they do in late summer/early autumn, the pinks might, in extreme cases, drive guests away from prime Atlantic salmon pools. Certainly personal experiences I’ve had on the Newport River, Co. Mayo, following the escape of large, sea-reared rainbow trout, would indicate to me that not alone are these fish a potential risk in terms of biological impacts, but certainly are a definite risk in terms of impacts on the quality of fishing a prime recreational angling fishery. In recent months it has become clear that very substantial numbers of pink salmon are present in the larger salmon rivers in Scotland, such as the Ness and the Dee. Currently there are reports of quite significant numbers of fresh redds in both these rivers. Biological work is ongoing to assess the potential impacts of these events. Wisely, Scottish Natural Heritage has organised a major scientific meeting in late September to assess the current distribution of pink salmon over the past summer and the possible impacts of these on our native fish species. These invaders appear to be hardy creatures. The most surprising aspect of their appearance is that against a pattern of declining Atlantic salmon numbers – which appears in large part to be due to a drop in productivity of the North East Atlantic – these pink salmon have found such an abundance of food that marine survival has risen to such prodigious levels that the surplus of fish surviving in the ocean has spilled over into many of the prime Atlantic salmon waters of Europe. It will be interesting to see what emerges from the Pink Salmon Summit in Scotland and fascinating to see what 2019 brings in terms of “Irish” pink salmon returns! Please report any catches, sightings of spawning pink salmon or of dead or dying kelts immediately to IFI (1890 34 74 24 or 1890 FISH 24). Use your mobile to take some images and be sure to take a note of the exact coordinates of where you encountered any pink salmon.